A good size population of birds hangs out in my front yard so I put out a bird feeder. It didn’t take them long to jump all over the free birdseed and I have to replenish the feeder every day. 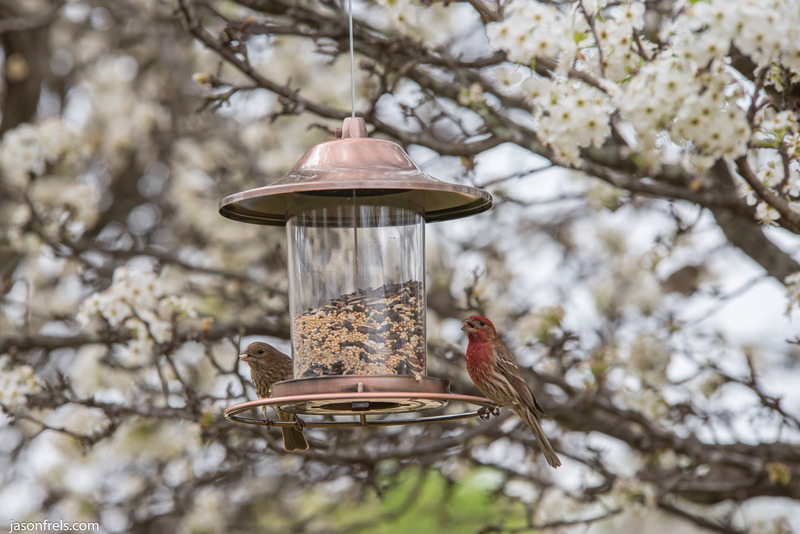 The birds won’t go near the feeder if I am nearby, so I set up my camera and 200mm lens on a tripod near the feeder, set focus, enable the remote control shutter release, and sat in a chair farther away from the feeder to watch. After a few minutes they returned to the food and I started clicking pictures. 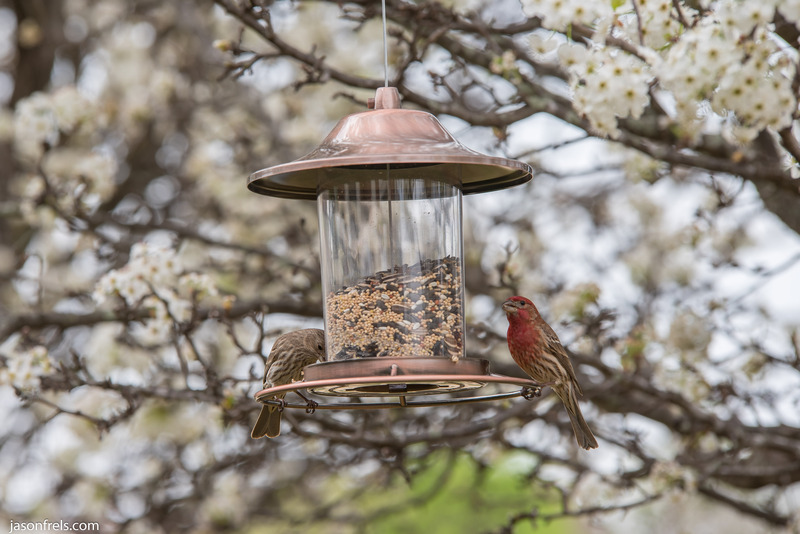 Below is a House Finch or Sparrow, not sure which, on the feeder. I thought that I might also catch a grackle or dove but they weren’t around at the time. I did get what I think is a male House Finch. The males have red feathers on their breast. I am not completely sure, as I am not great with bird identification, but it was something to photograph. I had a few issues getting the remote to work from so far away. My other challenge was focus as I was balancing aperture and shutter speed and I ended up with a relatively shallow depth of focus, which did help to blur the background and isolate the subject a bit. I set focus on the bird feeder but it would swing around as the birds landed on it. 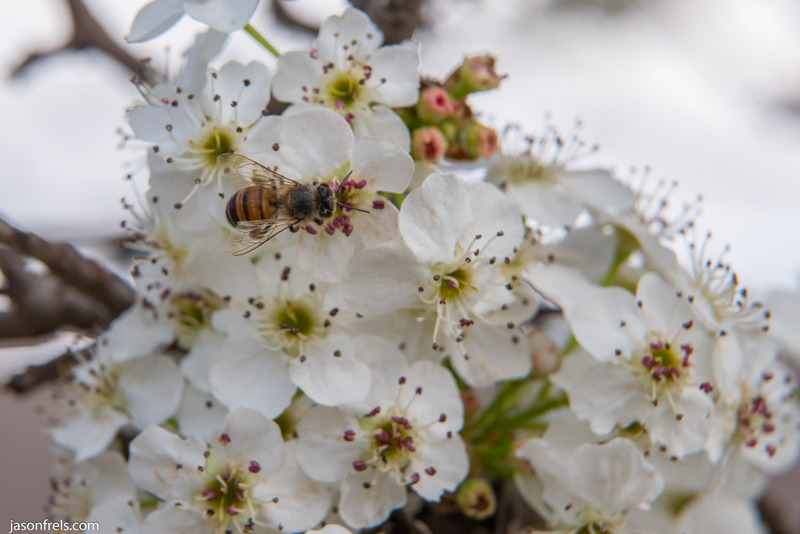 As you can see the trees are blooming and attracting bees, so I put on a 20mm extension tube and tried to get some good bee photos using the 24-120mm lens. 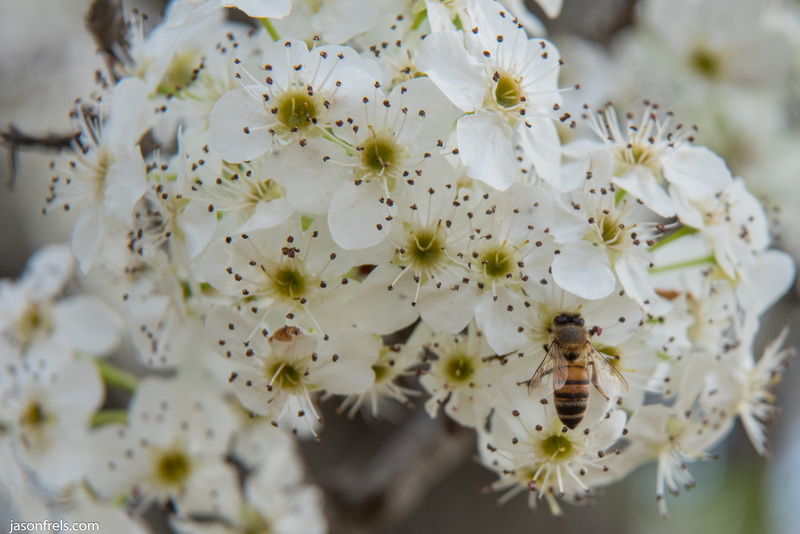 The main challenge is that bees don’t like to sit still and getting focus on them is mostly luck as the autofocus has a lot of trouble with extension tubes. I kept trying, alternating between autofocus and manual focus and got a few (bee) keepers. The above images are all cropped a bit. Using the extension tube I had to reduce the shutter speed a bit as I was getting less light. I didn’t want to bump the ISO too high but I probably could have pushed it to ISO1600. Believe it or not I boosted the color saturation on the bee pictures, because the flowers are really pale. Still looks a little flat to me, but it looks different on different monitors. Hope you enjoyed my discussion of the birds and the bees. A friend of mine set up his bird feeder next to his garden shed. He then cut a small hole in the side of the shed where he could poke a lens through and still keep the camera sheltered from the weather and reasonably secure. I’m not sure how he managed with the remote trigger but he got some good pictures. There is a Nikon phone app that can be used to connect to the camera remotely using WiFi and can be used to trigger the shutter. I thought about trying that if the IR remote did not work. The WiFi connection is slightly more tedious to set up, but I could hide around the corner and use it. Also, the minimum focus distance with this lens at 200mm is well over a meter, so maybe I will experiment with how close to the bird feeder I can get. But the closer I get, the narrower the focus depth, making it more difficult to get the bird’s eyes in sharp focus. 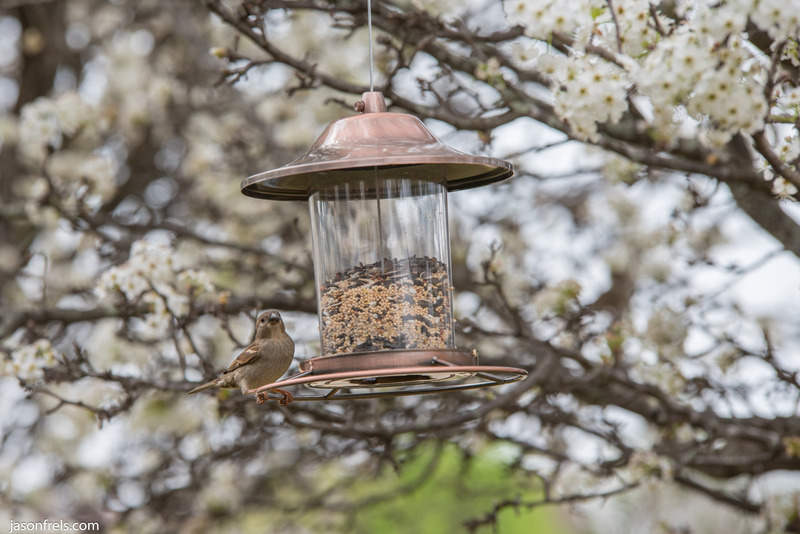 I don’t quite have the budget for one of those 500+mm lenses just to take photos at my bird feeder. I am not entirely certain they are bees vs. wasps, but I generally like bugs (outside of my house) unless they are ants.